OHT successfully delivers clear images of defective spots by visualizing the current flowing in the circuit. This is an inspection system using a capacitance-type sensor with fine electrodes arranged in a matrix. Voltage and capacitances` distribution can be displayed as a 2D image by capacitive coupling with the sensing object. 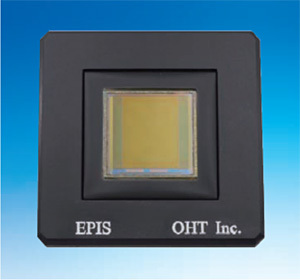 It produces high resolution, high frame rate, low noise, high dynamic range and high linearity. In addition to PCB inspection, it is applicable to various applications. Example of application of Open/Short inspection for PCBs. Get a view of electricity! 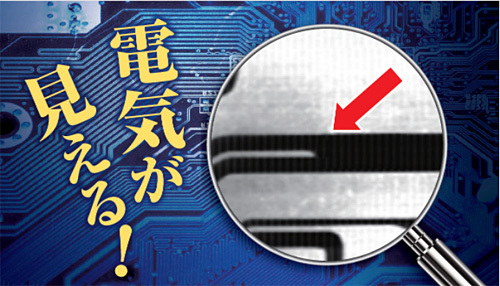 As you can see in the example of application, the defective spot hard to be found by optical image inspection is cleary shown by means of applying voltage to wirings in PCB and sensing them. ©2004-2019 OHT Inc. All Rights Reserved.